Our white-tailed deer graze across about 10 acres of grasslands and wooded ravine. The smallest of the North American deer family, these deer are found from southern Canada to South America. 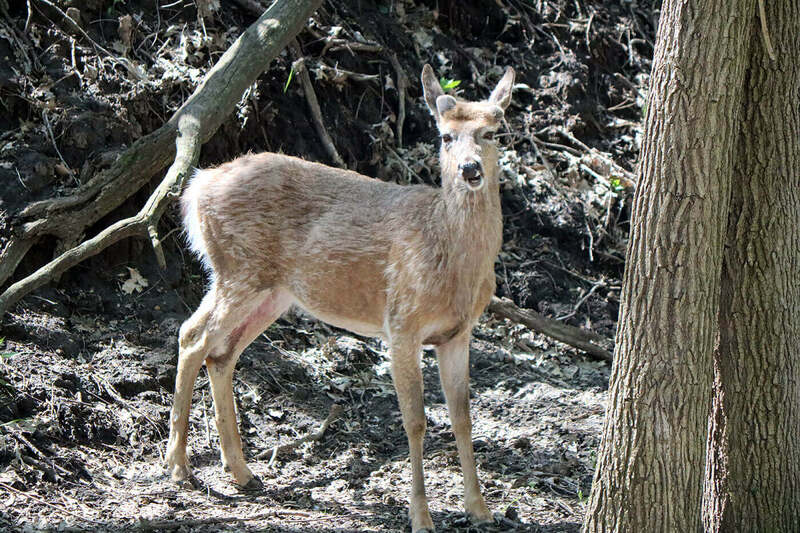 Visitors will need to look closely as white-tailed deer have perfectly natural camouflage - tan or reddish in color in the summer and grey-brown in the winter. However, males, called bucks, are easily recognizable during the summer and fall months with their prominent antlers. White-tailed deer are most active during evening hours and during the day, spend their time in cover. On hot summer days, you can see the deer toward the bottom of their shaded ravine. Fun Fact: Their name, "white-tailed," refers to the white underside of their tail. Their white underside displays when the deer wag their tail, a sign that they sense danger. They can reach speeds up to 36 miles per hour and leap vertically up to 8.5 feet.